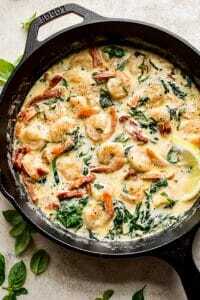 This creamy garlic Tuscan shrimp recipe with sun-dried tomatoes, spinach, and basil is rich, decadent, and ready in about 15 minutes! Great served over pasta or mashed potatoes. Melt the butter on medium-high heat in a large skillet. Add the flour and cook for about a minute, stirring until smooth. Add the garlic and cook for about 30 seconds or until fragrant. Stir in the cream, lemon juice, Italian seasoning, and sun-dried tomatoes. Simmer for 2 minutes. Reduce heat if it's bubbling too much. Add the shrimp and cook for around 5 minutes or until they're cooked through and the sauce is slightly thickened, taking care not to overcook them. Add the spinach and basil and cook for another 2 minutes. Season with salt & pepper as needed. Serve immediately. I like to squeeze extra lemon juice over top when serving (up to you). You could also grate some fresh parmesan over top if you wish. Serves 2-4 depending on what else is served with this dish. I used sun-dried tomatoes that were packed in oil (I drained the oil). If you use the dried kind, you may want to add more than 1/4 cup.